As of Jan. 1, all private insurance companies must offer discounts to those who buy and install winter tires. Drivers are reminded to look for tires marked the peaked mountain and snowflake logo, and install the tires on all four wheels. 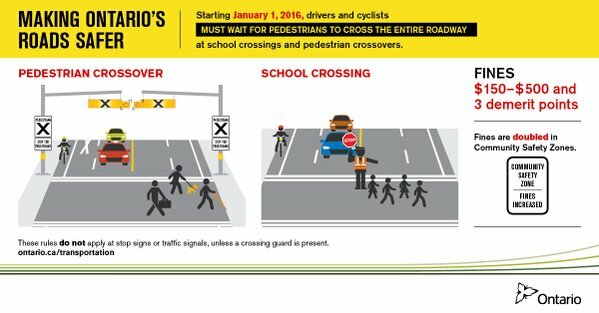 When approaching crossovers and school crossings, drivers will now have to yield the entire road to pedestrians. Previously, drivers were permitted to pass as long as the pedestrians weren’t in the vehicle’s path. As of 2016, motorists have to wait until pedestrians have completely crossed the road before proceeding. Some fees for drivers will also increase in the New Year. A full breakdown is available online. Last year, Ontario’s Ministry of Transportation introduced a series of new laws that included harsher fines for texting and driving, among other behaviours, in its “Making Ontario Roads Safer Act.” Now, as of Jan. 1, 2016, those fines include staying put while people cross the street — at least, at particularly demarcated zones. According to the Ministry of Transportation, all drivers (including cyclists) must now stop and yield the whole roadway at pedestrian crossovers, as well as school crossings that have a crossing guard carrying a stop sign. So that means you can’t just wait until people have cleared enough space to allow you to zoom through in these areas — you have to wait until they’ve fully reached the other side. It’s wise to equip yourself with these new rules and regulations before heading out on the road this New Year. If you’ve been in an accident we offer a free, one-hour consultation to discuss the particulars of your accident and how we can help maximize your compensation.